The MELSEC Series programmable controllers take control to the next level. MELSEC Series PLCs always meet your system demands and more, with something to offer for any prospective control system. The enhanced solutions are realized by a wide lineup of Mitsubishi PLCs and network systems. 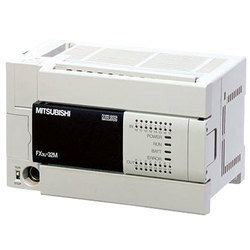 Mitsubishi PLC MELSEC-F Series, PLC provides a compact control solution with flexible options for system configuration. Power supply CPU, and I/O are all included in a single unit providing basic functionality that can then be supplemented with the wide variety of expansion options for I/O analog, positioning, and communications.